This was how our first conversation about Lindsey and Lucas’s engagement shoot went. I was hooked. 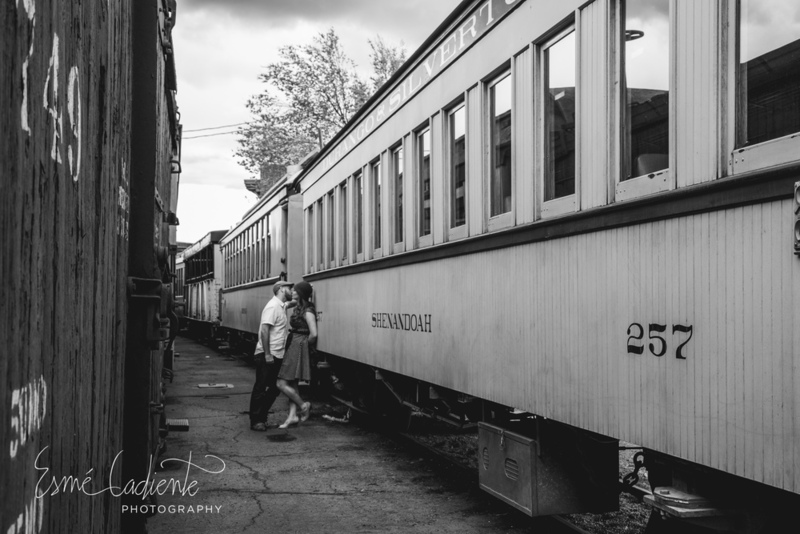 The fact of the matter is, there is no better place to stage a 1930’s railroad-era, debonair engagement shoot than the small Victorian town of Durango, Colorado. Over the next few emails we discussed clothing, props, shoes and libations that would compliment our inspiration. Finally, we chose four locations that spoke to our theme on a historic level as well as on an aesthetic front. This blog features Part 1 of the two-part series, a speakeasy and barber located in a building built in 1933- the year the prohibition ended, and the Durango-Silverton Narrow Gauge Railroad Station, the cornerstone of historic Durango. Keep an eye out for Part 2 coming out next week. Have a look at what we came up with – Part 1: Speakeasies, Mint Juleps and Railroads.